Mike impressed the inventor award judges with his revolutionary, reusable safety mask. It’s made of felted alpaca wool and acts as a safe ventilation mask for fire fighters. Since development the product has been adopted for a host of other purposes, such as protecting builders, miners, wood turners, farmers and asthmatics from dust and allergens. 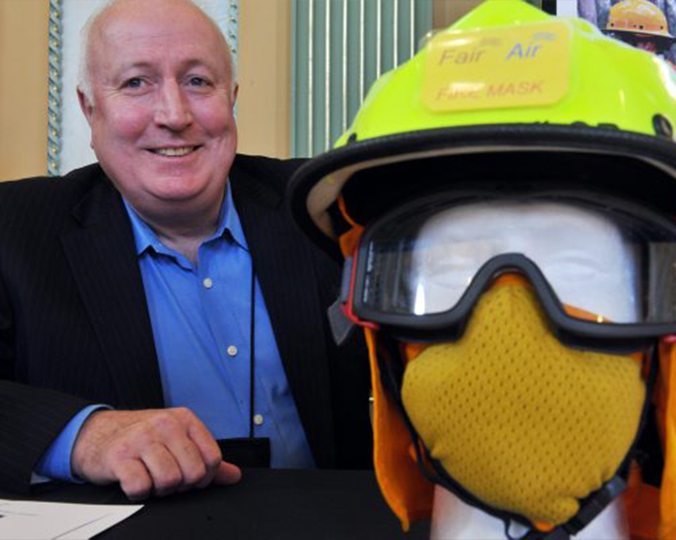 Mike impressed the inventor award judges with his revolutionary, reusable safety mask. It’s made of felted alpaca wool and acts as a safe ventilation mask for fire fighters. Since development the product has been adopted for a host of other purposes, such as protecting builders, miners, wood turners, farmers and asthmatics from dust and allergens. The inspiration to develop the mask came from first-hand experience. After much trial and error Mike discovered alpaca wool, which is breathable, highly fire resistant and kind to the skin. “Alpaca is quite different to wool in that it does not have protruding scales along the fibres, which with wool can irritate the skin and also causes piling,” Mike says. A CSIRO test to prove the mask’s efficiency surprised everyone involved. This test involved a flame of over 600 degrees directed onto the front of the mask. The standard requires it to take at least 17 seconds for the temperature to rise 24 degrees on the face side. The average for the Fair Air Fire Mask was over 33 seconds. “The CSIRO tells me it’s the only respirator that’s ever passed that test,” Mike says. Over 700 volunteer fire brigades across every Australian state and territory are now using the Fair Air fire mask. The Asthma Foundation is supporting the masks and after extensive evaluations the largest police force in Australia, New South Wales Police, have added the Fair Air mask to their equipment catalogue. Now any police officer in NSW can request their Local Area Command to supply them with a mask. The mask is now exported to New Zealand, Canada, USA, South Africa, Brunei and Afghanistan.